On Good Chef, Bad Kitchen , professionals take on the ultimate challenge: Cooking in a bare, under-utilized kitchen. 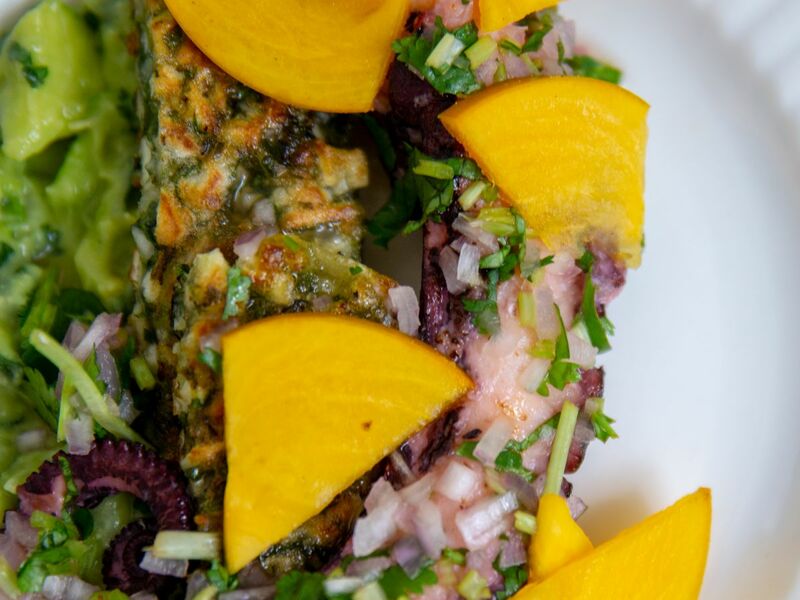 In this episode, chef Adriana Urbina, formerly of De Maria, shows us how to make a perfectly tender grilled octopus. There are several dishes in the world that at first glance seem a bit too high-maintenance for home cooking. Eggs Benedict, with its buttery, temperamental hollandaise sauce, is one. And octopus, with the propensity to get too rubbery and tough, is definitely another. 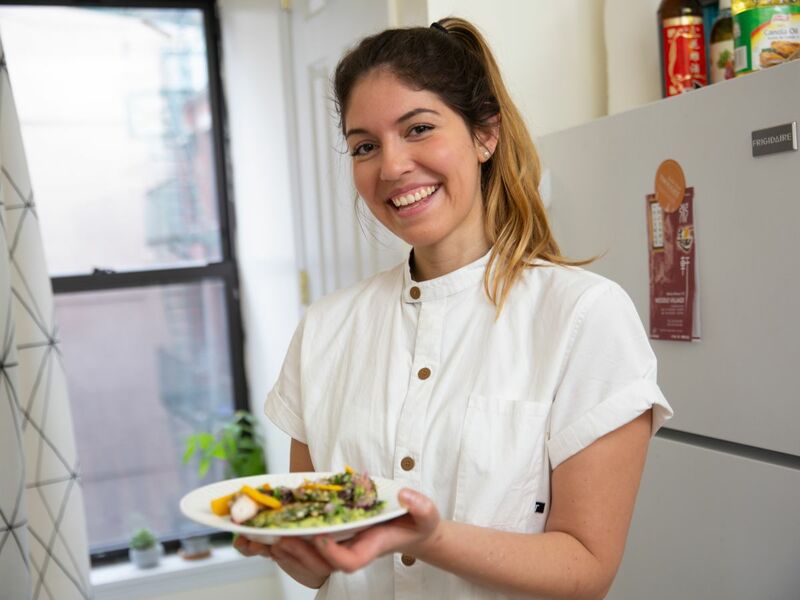 But Venezuelan-born chef Adriana Urbina wanted to prove to Refinery29 that this mysterious creature of the sea is, in fact, relatively easy to cook. The trick? “Scare the octopus,” she says, which means quickly blanching the tentacles three times before letting it cook, low and slow, in a savory stew of apple cider vinegar and aromatics. 1. Clean the octopus with water. Remove the black bits from the head and the beak from the mouth. Leave the eyes, as this will keep the tentacles attached to the head. 2. In a large pot, heat up some olive oil and sauté the onion, garlic, and ginger for about . 2 minutes. 3. Add the cilantro, peppercorns, and apple cider vinegar. Bring up to temperature, then enough water to fill the pot more than halfway. Bring the water to a boil. 4. Once boiling, carefully add the clean octopus to the pot. The water should cover the octopus but not overflow. Simmer until tender. This will take about 20 minutes per kilo. 5. Check to see if a toothpick or fork slides easily into the octopus. If yes, your octopus is ready. Remove from heat, and let sit in juices for a minute or two before removing and letting it cool down. 1. If you have a blender, put all ingredients in the blender and process until smooth. If not, smash up the peels, onions, pepper, garlic, and cilantro before adding in the avocado. Stir in lemon juice. 1. If you have a grater or a peeler, use that to shred the yuca root. If not, finely chop the root into tiny pieces. 2. Finely chop the herbs and stir them together with the yuca. 3. Mix in the tapioca flour and salt. Stir in some water until you reach the desired consistency. 4. Heat up a pan with olive oil. Using your hands, carefully form a small ball and flatten on the pan with a spatula. After a minute or two, flip the latkes to brown the other side. 5. Once both sides are browned, remove from the pan and place on paper towels to drain. 1. Prep the shallots and cilantro. Stir together with the liquid used to boil the octopus, lemon juice, chili, and some sugar to balance it out. 1. Separate the octopus tentacles from the body by cutting at the joint. Brush with olive oil and hold the tentacle over the flame from a stove to brown it. You can also do this in a pan. 2. Spoon the marinade over the octopus and let sit while you assemble your plate. 3. Slice your persimmons into thin triangles. 4. On a plate, spread the guasacaca, placing the latkes over it. Gently add your octopus, drizzling with more marinade. Top with persimmons.